UPDATE : 2016/10 Alyseum, the makers of this hardware product, have discontinued its manufacturing. They have a new product out, the U3-88c. It’s a USB 3 interface that provides similar functionalities, minus the Copperlan interface. 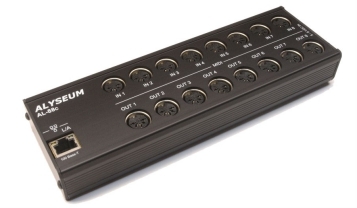 The Alyseum AL-88c is a midi interface with 8×8 Midi ports (8 Midi IN and 8 Midi OUT). If you have many midi devices, there will be times when you wish you could connect them all to you midi circuit… without having to channel it through a computer or connect the devices in series! That’s what the AL-88c allows you to do. It also connects to the rest of your Midi network using a UTP cable (Unshielded Twisted Pair (UTP) (just a standard Ethernet network patch cable). The advantage of using this device for midi is that it greatly increases the flexibility of midi communication links between Front-Of-House (FOH) instruments and Workstation/DAW (W/D) midi processing. As an added benefit, the AL-88c takes care of midi merge, split, transfer to/from FOH to/from W/D on a per-channel basis for each device/port. 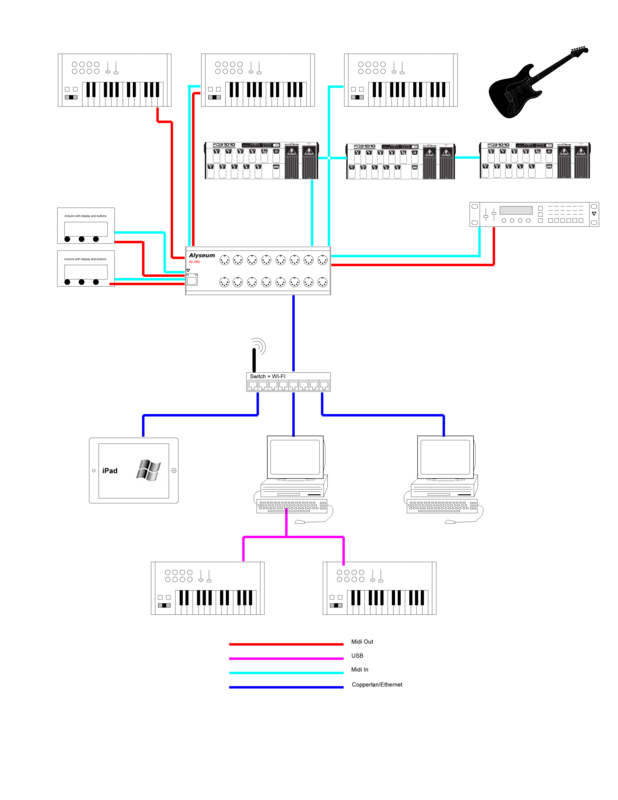 When you connect midi devices in series in a classic midi configuration, they share a single midi port/cable made of 16 channels. The AL-88c actually multiplexes each midi port/channel combination. Everything works in parallel. For this, the AL-88c relies on the Copperlan communications protocol for its internal and external configuration and to exchange information with the rest of your setup. In fact, the Copperlan Ethernet protocol allows multiple AL-88c to be connected to the same network. They can then be configured independently: two AL-88c offers a 16×16 midi patchbay, and four will give you 32×32! At the same time, each standard midi port has 16 midi channels. You end up with a truly gigantic midi patchbay! The AL-88c is a small extruded aluminium box (21 x 7 x 3 cm approx.) with the clearly marked connectors facing up. The Midi connectors are on the right, arranged in IN/OUT pairs and an RJ-45 (standard Ethernet) connector is on the left. A power connector (for the included power adapter, mandatory) is on the right side of the box. The unit is lightweight and very sturdy. There are no mobile parts and a couple of LEDs on the RJ-45 connector indicate activity. There is enough space on top of the unit to put a fine strip of sticky tape (just enough for the usual masking tape!) between the midi connectors, but I prefer to use larger labels on the midi cables themselves. So, my typical cables have two labels: one end with the instrument name/port (like VORTEX-OUT) and at the other end the specific midi connection (Midi IN – 8, for example). Inside the AL-88c. Click for bigger picture. Clean layout, clean construction. The two PIC 32bit micro-controllers(top left) handle the RJ-45 and the Copperlan application. The ATMEL ATXMega (to the right of the RJ45 connector) handles the serial midi communications. That’s about it for the physical aspect of the AL-88c. Simple. It will be immediately familiar to anybody using Midi, except, maybe, for its RJ-45 connector. The only way to link the AL-88c to the W/D, for configuration purposes, is through a standard network cable, either directly connected to a computer or to a network switch/hub. Using a hub is not recommended while playing because the number of inherent collisions (normal behaviour) might cause some delays/jitter, but it will work just fine for the configuration phase and testing. The UTP/Ethernet means that there is really no limit on the distance between the FOH and W/D. It could be in the same room or another studio, or across the street, as long a you respect UTP standards. Once configured, the AL-88c/FOH unit could use a pair of standard midi cables to exchange data with the W/D, but it is really designed to use the UTP cable. The UTP communication link does not use a standard network protocol (like TCP/IP used on most networks). Alyseum uses Copperlan technologies for data communication over Ethernet. Copperlan is a communications protocol that uses a standard Ethernet UTP infrastructure for data exchange. 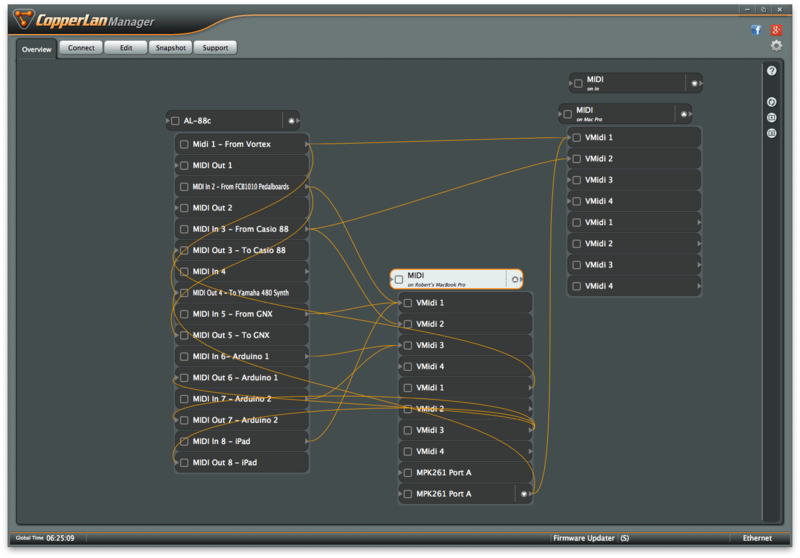 In addition to midi, Copperlan can handle audio or video communications on the same infrastructure. For midi, the hardware/software combination at various connection points handles the translation to/from midi (or other protocols). The company has written all the necessary drivers for midi, including clock and SysEx signal (actually claiming to handle ALL midi quirks transparently). In my test setup, I connected the AL-88c to my simple office/studio ethernet network. I haven’t tested communications on a dedicated Ethernet network. My studio network worked just fine. The key with Copperlan is that any device on a network sees every other Copperlan device on that network. What this means is that since the AL-88c is a native Copperlan device (the drivers are in the hardware), it is made visible to every computer (or other Copperlan device) on the network, as soon as it is plugged in. It will also show its current configuration to any other device, including ports names (identifying the connected equipment) and internal routing. This is not possible with standard Midi, USB, RTP-MIDI or OSC. So as long as you plug your midi equipment in the same outlet on the AL-88c every time, the AL-88c will use its stored configuration to show what is plugged where and to handle communications. To explain the configuration of the AL-88c, and of the midi network in general, let me explain how I constructed a test/future show setup. I have a setup that requires many instrument FOH for myself or other musicians and a sturdy Workstation/DAW for sound generation and signal processing. Think Daniel Mintseris with St. Vincent. In my current setup, I use many keyboards and some of them don’t even have USB connectors. My foot controllers are also strictly midi. So I use midi connectors only for FOH. My MIDI setup. Diagram does not include audio connections. Click for a bigger view. Some drawing elements taken from the AL-88c documentation (thanks Alyseum). In this diagram, the bottom part represents my main workstation. The picture below shows this setup. I use a Mac Pro (on the right) for most of the complex sound generation, either with Ableton Live or Apple Logic/Mainstage (or both, concurrently). There is also a laptop, a MacBook Pro for more sound and also used for most of the instruments/show control (through Ableton Live and other programs). I use one or more iPad/iPhone (not in the picture) for some sounds and some midi traffic monitoring and midi control. The iPad/iPhone use wireless when I move around the stage/studio but I use an iRig Midi connector when I need to make sure that the timing is good. Wireless communication for midi is prone to timing problems (amongst others). By the way, Alyseum also manufactures a USB device called the AL-USB that will give the iPad or any other USB device a 2-port Ethernet/Copperlan emulation. I haven’t tested it. There are two main midi controllers at the main workstation: an AKAI MPK261 and an Ableton Push. They are hooked up to the MacBook Pro using USB2 connections (through a hub). 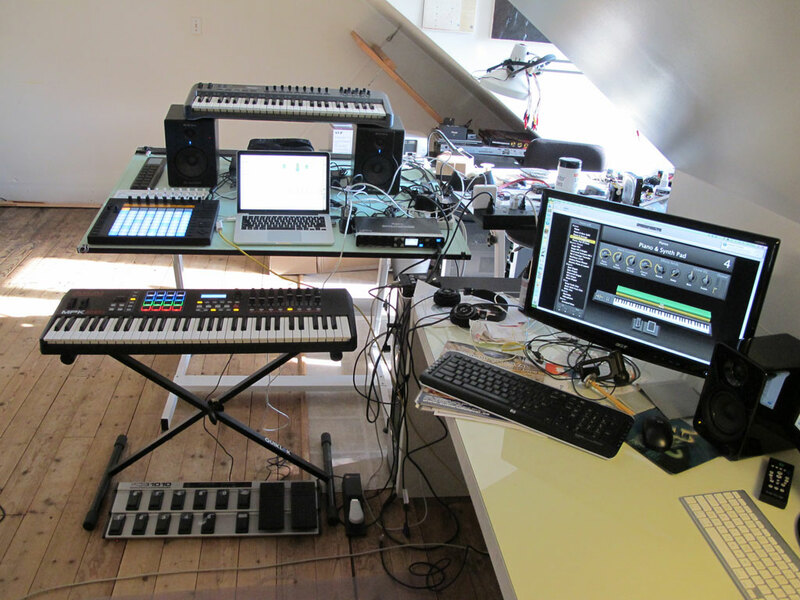 Occasionally, an M-Audio Oxygen 49 joins the other controllers (also USB)(on top of the speakers in the photo). I also use a modified FCB1010 Pedal Board at (under!) the main workstation. A couple of Korg Nanos can be of service, as well as at least two USB hubs. The main sound processor/mixer is a Roland Octa-Capture (just right of the laptop). It handles all sound from FOH and from every computer at the main workstation. My main Workstation. Click for bigger view. Midi connections for Front-of-house setup. No sound or power connections in this photo. Click for bigger view. The front-of-house section is made up of (from left to right) a keyboard, a very old Yamaha PS-480 that is used for sound generation only (as a synthesizer)(Midi IN). Next to the Yamaha, a guitar is hooked to a Digitech GNX3000 effects processor that is controlled via Midi (stored under the Yamaha) . A Behringer FCB1010 midi pedal board is used to control the Digitech that sits on a rack, safe and out of the way. It also talks to Ableton Live on the MacBook Pro when additional signal processing is needed. Two other keyboards are used: an old Casio fully weighted 88 key (with an incredible key feel!) 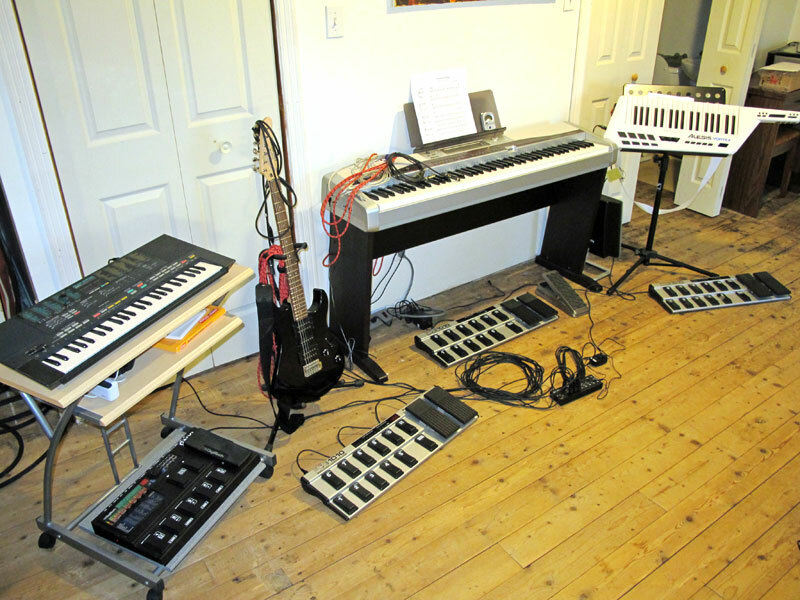 and an Alesis Vortex for solos (on the right in the photo), each with an associated FCB1010 pedal board. The three Behringer FCB1010 pedal boards are linked in series (on separate channels). They do not generate much midi traffic so a midi series connection is adequate. Two Arduino micro-controllers (not in that picture) are used for data display (big blinking status LEDs and a small display) and can process some midi commands (via push buttons). On a real stage or in a bigger studio, everything would be spaced more logocally and the midi cable lengths would be adjusted. There should also be a couple of mikes and a few kilometers of cable for sound and power but I took the photo before hooking them up, for clarity. The Alyseum AL-88c is used for the front-of-house connections (in front of the middle FCB1010)(yes, it’s that small!). Six Midi OUT ports and seven Midi-IN ports are used to connect everything back to the main station for Midi input or output. The AL-88c is connected to each FOH instrument using standard 1 to 8 meters (3 to 25 feet) midi cables. A network patch cable (RJ-45 UTP) is used for W/D connection. I have tested various lengths for the patch cable, from 3 to over 30 meters (10 to 100 feet). So, to configure the AL-88c, you need to install the Copperlan Manager software on at least one computer (or tablet) connected to the same network. You don’t need to run the Copperlan Manager after the configuration is complete. The AL-88c has to be connected with a UTP cable (RJ-45). Using a midi cable will not work for configuration. When you install Copperlan Manager on your computer, special drivers are installed as well, making that computer a Copperlan device. As stated above, every Copperlan device on your network sees every other Copperlan device. The Copperlan screen is refreshed automatically on every device. Since an iOS version is available, your iPad would also show any configuration change. Hence, and quite obviously, installing Copperlan on each computer will greatly enhance the midi connectivity of your network. Let’s break this demo in three different tasks: First, I will configure the AL-88c. Second, I will configure the computers and last, I will configure the connections between the various midi ports. Plug the AL-88c in your network switch (or directly to your computer). A simple hub will work for configuration too. When you start the Copperlan Manager software on your computer, you first have to choose the Ethernet card that will be used to communicate with you Copperlan network. It can be the same interface as you normal network or you could use a dedicated card. As always, just click on an image to see a bigger version. As soon as you choose a card, the Copperlan network becomes visible. If it doesn’t, choose a different network card. In my case, you see the two computers, the MacBook Pro laptop and the Mac Pro, and the AL-88c. I have, of course, installed the Copperlan manager on those two computers. These are the 8 midi IN and OUT ports of the device. I have renamed the ports using the “edit” tab of the manager. The orange “links” are connections between devices. I’ll get into that later. Now that the AL-88c is taken care of, I will configure the computer midi ports and prepare them for communication with the rest of the Copperlan network. Note that the MPK261 keyboard is already named on the MacBook Pro. It is connected using USB, which can handle more parameters than midi. So the name of the device is already associated with the USB port as soon as the instrument is plugged in. This is normal USB behaviour. 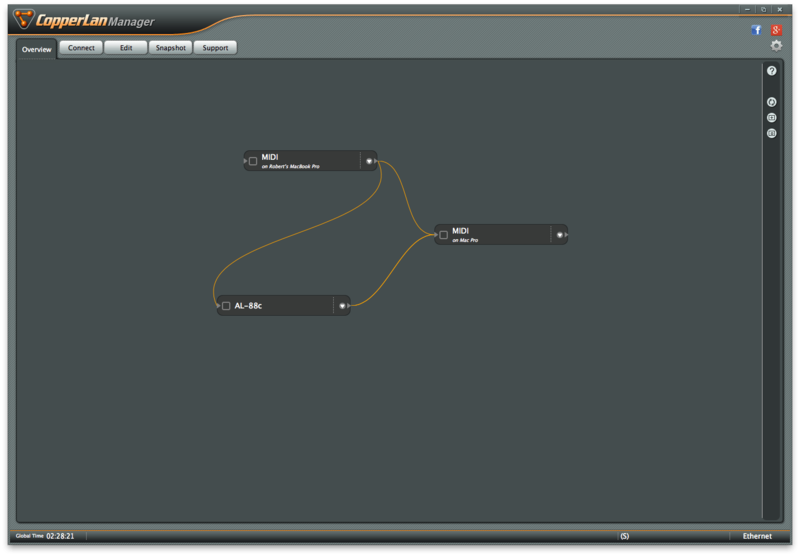 Finaly, the next step is to connect the active midi instrument to a synthesizer or other sound generating device. In this case, it’s a combination of an external synth and Apple Mainstage (listening to vmidi1) running on a separate computer. The Copperlan Manager used in these videos gives a good graphic representation of the connections. For simple arrangements, it works fine. For a larger installation, the proprietary user interface has its drawbacks. Copperlan Manager has a few bugs/quirks and the learning curve can be steep. For example, you can look at the whole configuration environment (in the Overview tab) or a limited subset (whatever fits in you screen at the preset zoom level). There is no smooth zoom in/zoom out function; only two presets. Also, making configuration changes, especially when changing connections, forces a redraw of the Overview screen, where the program choses how Copperlan devices appear next to each other, overriding your own work. I would prefer to set connections using a more “spreadsheet-like” interface made of rows and columns. In the end, I was able to set up my testing environment and I do appreciate the relative “ease” in modifying the various connections and their parameters. But the graphical environment doesn’t make figuring the logical arrangement easy. Once your configuration is completed, you can store it on a computer using the “Snapshot” tab. This also means that stored configurations can be recalled. This is ideal in an environement where the devices could be moved or connected differently. You would just hace to reload a named configuration file. The actual testing was as smooth as can be. There wasn’t a single glitch in the system. It never went down and there was never any perceivable delay on the connected devices. The manufacturer claims sub millisecond delay/jitter and although I could not measure it, I have not noticed any audible artefact caused by my midi network. I have tried to overload the midi transmission but although I was able to saturate individual midi links (normal midi behaviour), as I would if I was connecting an instrument directly to the computer, proper Copperlan configuration kept every port running concurrently. There was never a dropped midi command (especially Note OFF) that I couldn’t pinpoint to its source (my Alesis Vortex is prone to that). So midi traffic seems to be trivial to the bandwith offered by Copperlan. I did not use fancy network/sound measuring techniques. I leave that to professional studios who are better equiped and know a lot more than I do. I just trusted my ears. I know my instruments and my synthesizers. The Alyseum AL-88c Midi interface is a solidly built, simple to use midi port aggregator and dispatcher. I haven’t had a single problem with it. I love its ability to easily connect a lot of equipment while offering a lot of flexibility with midi port and channel management. I was impressed by the flexibility offered to interconnect instruments FOH instantly. You don’t need to use a computer after configuration. And since the AL-88c can immediately recognise other Copperlan devices (pre-configured), you can use more than one and really expand your midi network. The UTP convenience is a definite plus. I plugged my laptop into my Office/Studio network for most of the test period, but I also, at some point, moved that computer to the FOH where it was plugged into a separate network switch. It reconnected instantly and worked as configured. That second switch was then connected to the Office/Studio network and that meant that the Mac Pro just reconnected to everything also. The Copperlan Manager, mandatory to configure the AL-88c, is functional, but the learning curve is not pleasant and very little help is available on-line for new users. It works, but the quirks and bugs make it somehow difficult to use. Nevertheless, I give it a big + for being free (including the SDK, if you’re tempted). Also, even without an AL-88c (or other Copperlan device), the Manager will help you with your midi configuration. Keep in mind that the Copperlan Manager is free software. It will evolve (it is still actively updated as of this writing). I could use another Midi concentrator/merger (Midi Solutions, Motu Xt, Behringer, etc) but the real advantage of the AL-88c is the Copperlan network management that takes care of the communications on the UTP cable. Some of the other multi-port midi interfaces have a single midi port output or use a USB connection to connect to your W/D. The USB has some drawbacks: USB cable length is limited and USB can cause delays/jitter. Midi is also limited by its cable length (max 15 meter/50 feet) although you can add a repeater. Copperlan, on the other hand, can use hundreds of meters of cable and even use your existing network topology (as long as it adheres to Ethernet specifications). This entry was posted in AL-88c, Music equipment and tagged midi, music. Bookmark the permalink. Cool. I use a Digital Music Corp Mx-8 for my midi merge and concentrator. And some day a wireless for my Vortex, YES! Just recently setup the MX-8 and wired up a couple of other modules to it. Been a long time since I had that stuff up and running but I managed pretty quickly. Glad I could Help. Please post your feedback! Does this only count for a hub or also for a switch? Because i have only one network out on my pc, and thats for my internet. A switch will work fine if it is configured to channel traffic ( many are ok by default). I’m thinking about switch to CopperLan system for my studio. I write my music on Cubase via MIDI to be played from lots of vintage synthesizers spread on huge space, so it gives me the chance to get a rid of lots of long MIDI cables. – Record it back from MIDI IN on a new track. Each kick hit has its own delay and its own lenght? I’d like having always the same delay and note leghts must be long as the original ones. This NEVER happened on every USB>MIDI interface i’ve tried before. Some example in pictures below, as you can see, behaviour is totally unpredictable because each beat has its own delay and its own lenght. Please, give me the clue to switch to a tight timing system!!! P.S. Which LAN adapter are you using? I’m considering to buy a PCIe card with Intel chipset. Is this a test you did on an AL-88c? Or is this a test you did on copperlan? Pictures shown a test i’ve done on several USB to MIDI interfaces whit almost same results. I’d really like to know if AL88C behave with same test or not, please. Both of these values on USB MIDI interfaces give random and unpredictable results. I’d really like to know “HOW” AL88C behave with same test or not, please. The fact that you tried the same test with more than one USB MIDI interface with the same results leads be to believe that this is a software issue, not hardware. What also points in that direction is that there seems to be a variable delay on Note On AND Note Off commands. Usually, a delay is very regular. This looks more like Jitter. You described you test rig as a simple midi cable between output and input. This will likely result in unpredictable results if you run the test long enough without a reliable clock. 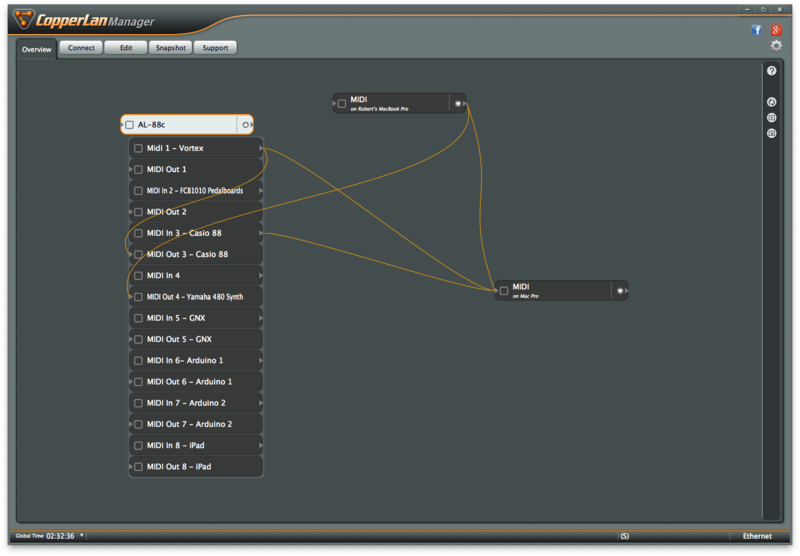 More over, USB is causing jitter by grouping Midi commands before transmit (or receive). They are minute delays, but they do add up. I don’t think that in normal playing you would have significant random delays. Can you include a graph of your connections between intruments and computer so I can suggest alternatives (if I can…and if I may)? Bought an AL88-C and hooked up tpo my DAW (Cubase 8 on OSX 10.9.5). Made a simple 4/4 beat on Channel 1, looped back from MIDI OUT 1 to MIDI IN 2 with a 30cm MIDI cable. Recorded it back on another MIDI track, result seems terrible. From Cubase setups i’ve tried all combinations between MIDI THRU, SNAP TO BAR, ASIO LATENCY COMPENSATIONS and so on. I’m not looking at sample accuracy, but Issues are quite the same than USB MIDI ones, and worse in some case. Could be the motherboard chipset (Gygabyte Z77 UD3H) ? A new 10/100/1Gb PCIe card will arrive next days, but i think it’s not the solution.